Our premium PTFE coated fabrics are manufactured from woven fiberglass substrates and offer the highest PTFE content thereby making the surface extremely smooth. 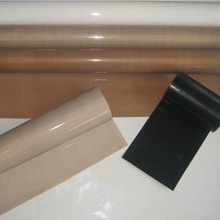 These fabrics have the highest dielectric strength and provide the best release. Available in standard thicknesses of .003″, .004″, .005″, .006″ & .010″. Higher mil thicknesses are available. Typical applications would be for heat sealing, plastic bag manufacturing, electrical harness assembly and food belting.